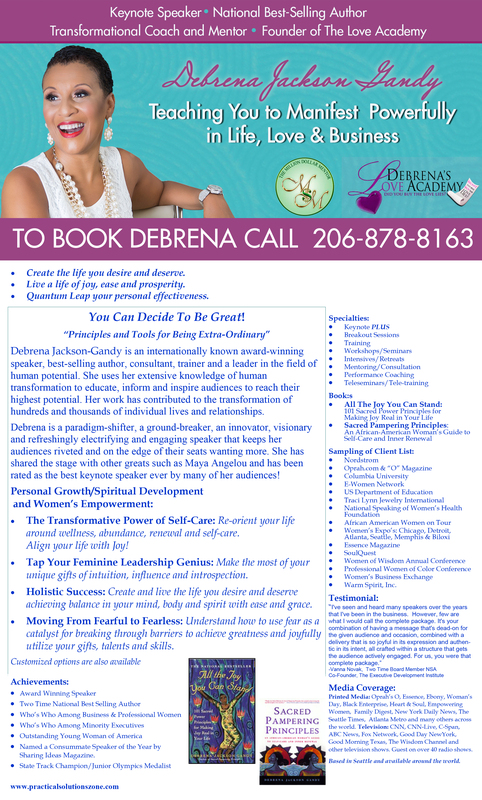 Debrena can speak on the topics below or CUSTOMIZE a presentation for your group, event or organization. 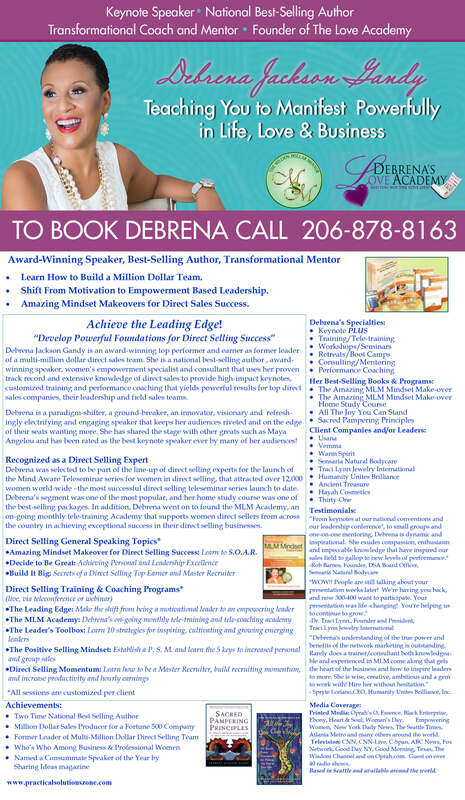 Debrena is a guest contributor for the Huffington Post, and has been featured in Oprah’s “O” magazine Essence, Ebony, Black Enterprise, Woman’s Day, and Heart & Soul, as well as the New York Daily News, the Seattle Times, the Chicago Defender, Dallas Morning News, and Atlanta Metro newspapers. She’s appeared on TV on CNN, CNN International, Good Day New York, Good Morning Texas, C-SPAN, The Better Show, New Day Northwest, Baltimore’s Channel 2, and the Wisdom Channel, and has been a popular guest on 55 radio shows across the country. She’s appeared on numerous blog sites as a guest blogger, and on websites such as Oprah’s O, Essence.com, JetMag.com, Ebony.com, and MSNBC.com. She also hosts a TV show on Trinity Broadcast Network, on station KTBW- Seattle/Tacoma. 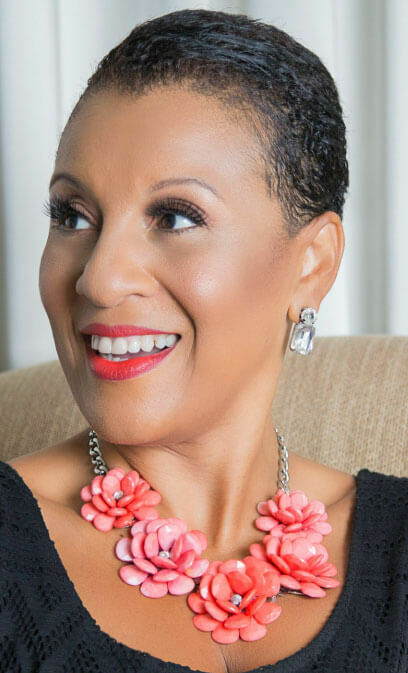 She has been named one of the top African American female motivational authors by BET.com; was an award-winning direct selling leader of a team of nearly 3,000 women; a Speaker of the Year by Sharing Ideas magazine, and was recognized as “A Woman on The Move” by Today’s Black Woman magazine. 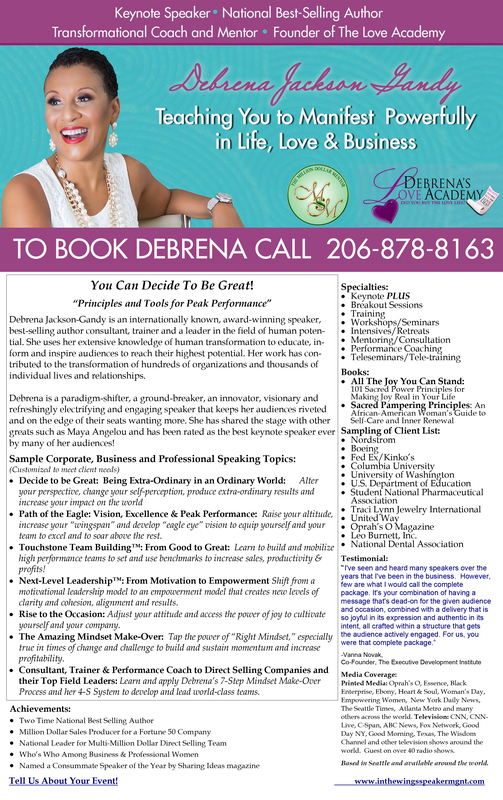 Her clients include Fortune 500 companies, women’s conferences, professional associations, state and federal government, top colleges and universities, and non-profit and community-based organizations. Visit the Media Lounge for featured appearances.